What is a Thin Place? Coming into Armagh from the Monaghan Road one gets a dramatic view of the city skyline, especially at twilight. The view is dominated by two buildings on two hills – St. Patrick’s Cathedral and St. Patrick’s Cathedral. 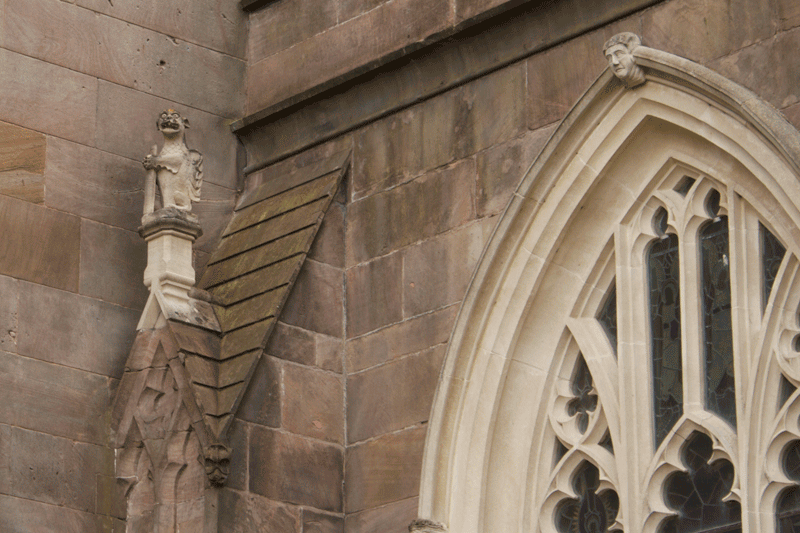 Both are diocesan bishoprics, both are built on holy ground and both are tied to legends of St. Patrick. One is the Church of Ireland cathedral built on the ancient holy site where St. Patrick is believed to have built his first stone church in the 5th century. 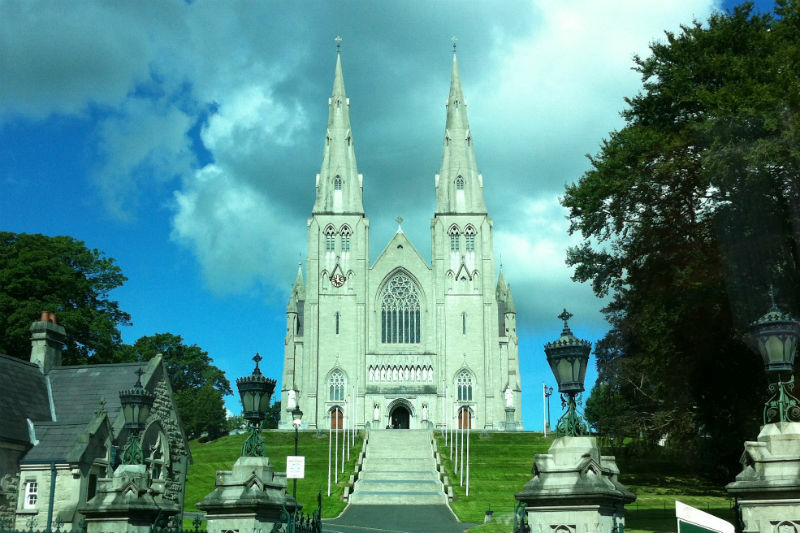 The other is a stunning Gothic-style Roman Catholic Cathedral, its cornerstone laid on St. Patrick’s Day 1840. It was completed in the early 20th century, with a serious halt to the construction during the Great Hunger. 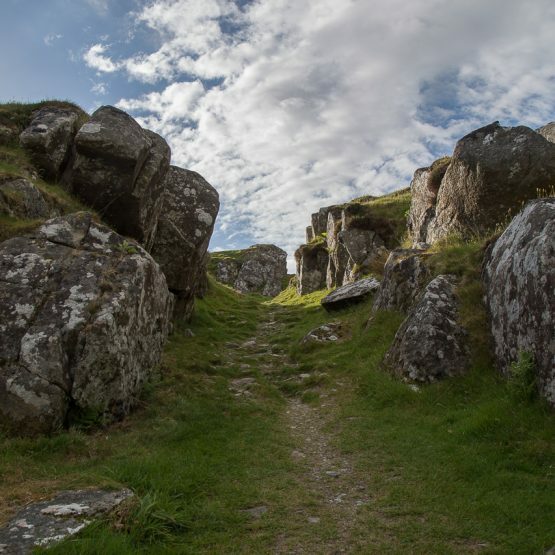 Armagh is known for being the ancient seat of the Ulster kings and the place that gave us the Knights of the Red Branch and Cuchulainn – the Hound of Ulster, a who was the Incredible Hulk of Ireland. Ard means hill or height and Macha is the name of an Ulster goddess who had super powers enabling her to run faster than any living creature. When she was pregnant and near delivery, her prideful husband boasted to the local king who was also prideful about his swift horses, that Macha could outrun them. The embarrassed king ordered Macha to prove it by racing his fastest horses in a competition staged in the presence of all of his friends. Macha begged for mercy because she was heavily pregnant, but the king refused her pleas and forced her to run the race. Macha ran – and won. All, including the king were in awe of her strength. But at the end of the race Macha collapsed and died whilst giving birth to twins – a boy and a girl, one representing a blessing and the other a curse on the Ulstermen to last nine generations. The blessing was that Ulstermen would develop great strength and be the mightiest warriors in all the land. The curse was that at the times when they are in the greatest need, they would be stricken with the pains of childbirth and be incapacitated for five days and four nights. The boy went to sea (the otherworld) and met his mother and the other gods and goddesses. The girl stayed behind, motherless in a world that exploited and oppressed her kind. 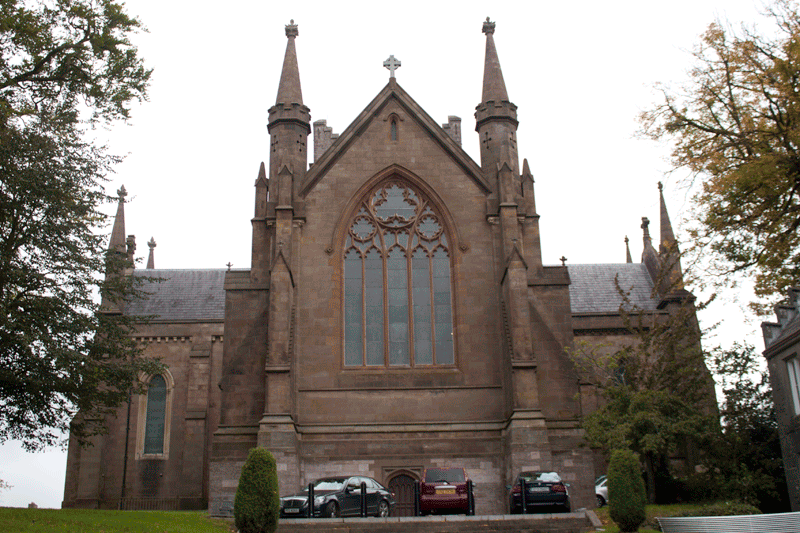 The twin pinnacles in the Armagh skyline are side-by-side hills each capped with a cathedral of two similar faiths. The two religions have a history of bloody conflict that goes back 700 years. They are the Catholics and the Protestants of Northern Ireland. Some say they mirror the ancient story of the twins of Macha, forced to be birthed violently because of pride, arrogance and greed. One allowed to be the warrior and the other oppressed with little power, forced into servitude. Triumph and tragedy. Blessing and curse. But today’s Armagh shows few remnants of that conflict. People are warm and friendly, the downtown has nice shops and restaurants. It’s a busy town, but there are only scant traces of the brutal conflict that raged only a few decades. If I hadn’t been to Northern Ireland during the Troubles, I wouldn’t be able to measure the difference. But as a visiting American who traveled there both when the country was occupied and in recent years, I see the radical difference. Today there are no soldiers in the streets with machine guns, or crouching in alley ways, no razor wire, no moratorium on cameras and taking pictures, no tense people who don’t look up as you pass them on sidewalks – locals who provide no warm welcome for visitors… except for a few who were in the tourism business, and even they were guarded. Don’t get me wrong. 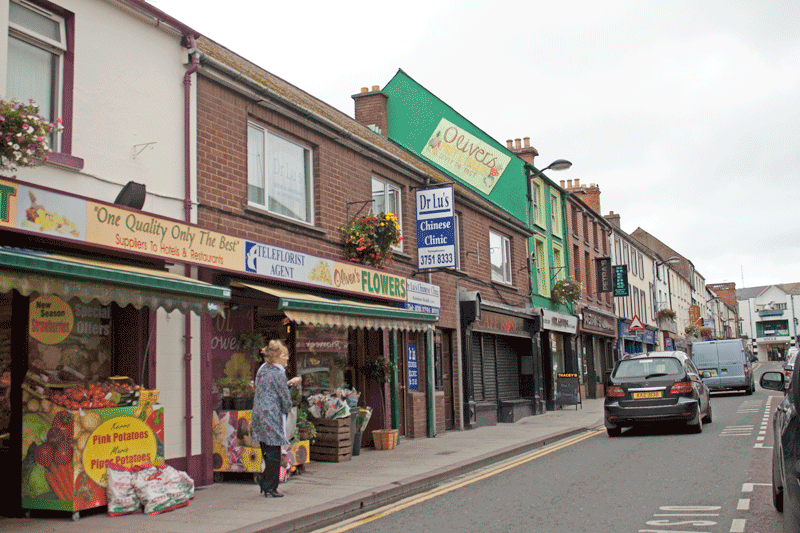 I loved Armagh then and I love it now as I love all of Northern Ireland. The only difference between the two time periods is that the curse is lifted. The two sides want to get along. They want peace. They want their children to be safe. They want to thrive economically and welcome visitors. Both sides know and always have known that they live in a magical land – a land of pristine beauty, a land of stories, a land of mystical energy. They’re eager to share their country’s treasures in the safe environment that has grown out of their commitment to peace. And visitors are very welcome. 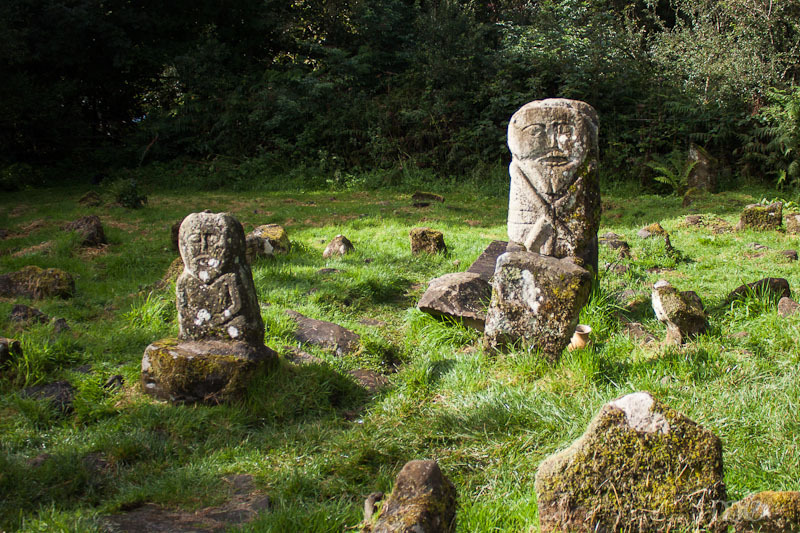 During all of the troubles and conflict, the ancient Janus figure still stood watch in that mystical cemetery named Caldragh in County Fermanagh. Saint Patrick’s Chair and holy well was still perched in the Altadaven Forest waiting for pilgrims to come forward and present their wishes. The sands of Whitepark Bay still sang in the wind. The stone circles at Beaghmore were still lying in wait in the shadow of the Sperrin Mountains ready to enchant the visitor looking for those spiritual ports in the storm that we call thin places. The North has always been beautiful and worth visiting, but it’s good to see the people of the North enjoying their land and each other. 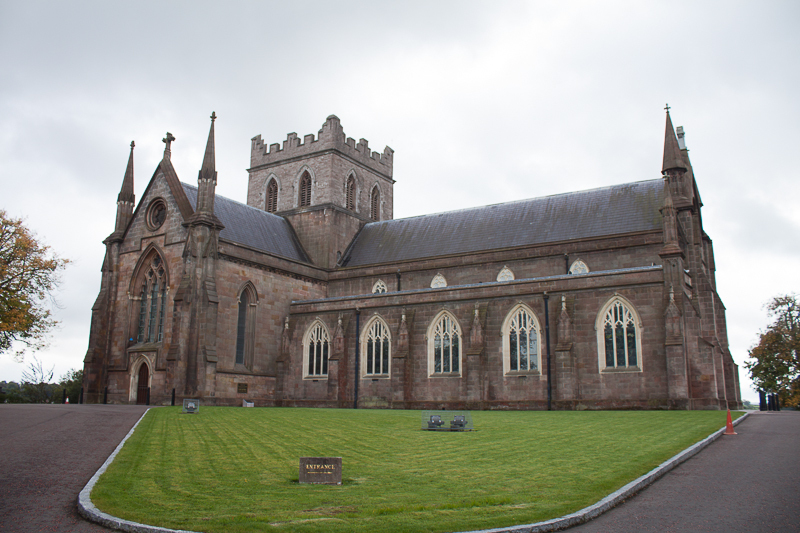 Both St. Patrick’s Cathedrals in Armagh are a part of our Discover the North tours as are St. Patrick’s Chair, Caldragh Cemetery, Beaghmore Stone Circles, Whitepark Bay and many other mystical sites. Author, travel writer, wise woman with goddess attributes, travel hag. Content and Photos (C) copyright 2018 by Travel Hag Tours, LLC unless otherwise stated. All Rights Reserved. Use only with written permission.